I see a lot of SQL. Actually, I see a lot of bad SQL. I guess that's because my job is mainly to help people with performance problems and the majority of the time, the problems are rooted in one or more inefficient SQL statements. Yesterday I was doing a demo of our Profiler software and showed one case that I see over and over, so I thought I'd share it here. Given the fact that this one statement accounted for 74% of the overall response time, with a quick look at the rest of the profile, you could see that this one query was responsible for almost all the response time consumed by the top 3 events in the profile. So, the cool thing about this profile is that it was easy to see that by fixing one SQL statement, we'd basically get rid of our dominant problem. Now, a bit more info. This statement was executed 1,332 times during the almost 5 hour period captured by the trace. The query returned only 587 rows and did a total of 141,084,499 block accesses (LIOs). That means that on average it took almost 160,000 LIOs for each execution. Ummm...that's not good. It should be using something like 20 LIOs or less per row (based on a maximum tolerance of no more than 10 LIOs per joined table per row). It kinda seems obvious that there's a big problem with this query doesn't it? So, why had this process been running for so long without someone catching it? I mean, if we could fix this one statement, we could cause as much as a 74% reduction in response time. That means the 4 hr and 44 minute process could drop down to about 1 hour and 15 minutes. But, once I was able to point out the combined effect of executing that SQL over 1300 times in their production, full volume environment, the problem was (all of a sudden) easy to see. Something needed to be done to make this SQL statement more efficient. This is exactly what was going on in the problem query in this process. Simple change, massive difference. I didn't get to stay around long enough on the client site to see the fix implemented in production, but the expected benefit would mean, as mentioned above, that the response time should drop down from nearly 5 hours to just over 1 hour. Nice. So, I'm always glad to see examples like this one pop up when I'm helping a customer with performance issues. The analytic function is a nice alternative to the traditional way of writing these types of queries that works extremely well and provides the performance needed for high numbers of executions in a high data volume environment. We got a question at work today from a blogger in regard to his blog post entitled MIN and MAX Functions in a Single Query are Disastrous. If you check out his post, you'll see the details of his tests. Basically, he was wondering why the optimizer would choose to do a full table scan instead of using an INDEX FULL SCAN (MIN/MAX) operation for a query that contained both a MIN and a MAX function call on the same indexed column. I thought my answer to his question to us, about why the optimizer makes such a "bad" decision about the execution plan, would be a good topic for my post today. Normally, if you write a query that uses only one call, either MIN or MAX, the optimizer will use the INDEX FULL SCAN (MIN/MAX) optimization to read only through to the first leaf block (for MIN) and to the last leaf block (for MAX). This is a great optimization that can save hundreds/thousands of block accesses over either a full table scan or even an INDEX FAST FULL SCAN. But, as Momen's tests show, if you execute a query that has both MIN and MAX in it, the optimizer refuses to use this optimization although it would seem to us (the feeble human brain) that the optimizer should know that it could do the operation twice, once to get the first block and once to get the last block, right? But, the optimizer can't do this. The INDEX FULL SCAN (MIN/MAX) operation will do either an index scan for the first leaf block or an index scan for the last leaf block. It can not do both at the same time. Think about it... The code to handle the operation would have to have some fairly specific logic in it to handle the dual calls. The question to then ask is why wouldn't Oracle choose to add that logic? Well, since there's actually an easy way to get the result you want using the current operation's code path, I'd say Oracle didn't want to invest development time into writing specific case code when the simple branch of MIN or MAX can work properly as long as the developer knows how to write their SQL to invoke it. The same results could also be achieved by doing a UNION of the two separate statements. Either way, what is required is that the developer must understand how the optimizer utilizes the INDEX FULL SCAN (MIN/MAX) optimization and write their SQL to take full advantage of it. Perhaps at some point (I haven't tested this in 11g yet to see if the optimizer behaves any differently) the optimizer will have code path to handle both calls simultaneously, but for now, the developer must provide the optimizer with syntax to allow the optimizer to formulate the optimal overall execution plan. To me, this is just one more really good example why the database should not be "just a black box" to developers. Writing high performance SQL requires understanding how the Oracle optimizer works, not just an ability to put together a statement that gets the correct answer. Thanks to my colleague Ron who did the 11g test on this and he confirmed that the optimizer behavior has not changed. So, even in 11g, the SQL would need to be written to submit the MIN and MAX calls separately in order to get the optimal execution plan. I read recently about a study conducted by product review online TV site, ExpoTV, where it was found that many people do actually want to "have a conversation" with a brand. Brand can mean many different things. For example, Mr. Whipple (Charmin) and Tony the Tiger (Frosted Flakes) are examples of spokespersons who become part of the brand. Logos or fonts can also represent brands. Think of the Disney font or the font used for the Harry Potter movies. Branding is also slogans, like Nike's "Just do it". And sometimes the brand is just the company name like Apple or Starbucks. - Consumers not only want to talk to brands, they want to establish a conversation. 55% of consumers want an ongoing dialogue with brands. - Learning about new products in the pipeline is a top priority. Respondents were most anxious to talk to the product design (49%) department, followed by customer support (14%), marketing (14%) and pricing (13%). 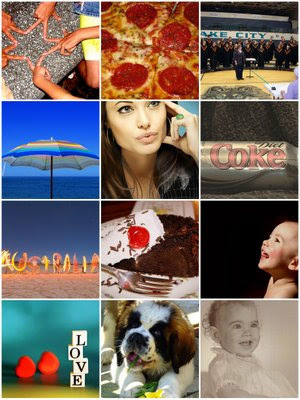 - Positive brand experiences can generate word-of-mouth buzz. More than 60% of those polled said they tell 10 or more people about the products they like while a third tell 20 or more people. - Listening leads to loyalty. 89% of respondents would feel more loyal to brands which invited them to participate in a feedback group, and 92 percent of those who have a positive experience communicating with a brand will recommend purchasing a product from that brand to someone they know. - Consumers are open to engaging with the competition. 93 percent of consumers surveyed would be interested or very interested in communicating with competitive brands that expressed interest in their feedback if their first choice is not interested in hearing what they have to say. I know from my own experience with my iPhone and Kindle for example, that I'm more than happy to share my experiences with others and to recommend the products based on my good experiences. I really like being able to check forums for questions and reviews and I think more highly of those companies whose products I buy that provide them. I think this is important for any business, or even people in the public eye, to know. People want the opportunity to interact and to share. I think that's one of the reasons why blogging is so popular. Making your brand hard to interact with makes people think you've got something to hide and makes them wary. Opening up a discussion that allows people to share anything/everything about your brand can be a bit scary. I mean, what if someone says something "bad"? In the end, I think that an open dialogue is most important and if there is something "bad", it gives the brand owner a chance to respond and make corrections and have that be seen as well. I like hearing stories where a company "made it right" with a customer. It makes you believe there is a real concern about the consumer involved and it's not just a big machine cranking out product with the only goal being revenue generation. Revenue is certainly important, but if you treat your customers in a top-notch way, the revenue will come. Oracle has had the "unbreakable" marketing spiel going for some time now. I don't know that I buy their bit, but today, I found the ultimate in unbreakable and it has nothing to do with Oracle. Move over Oracle. Meet Fisher Price. 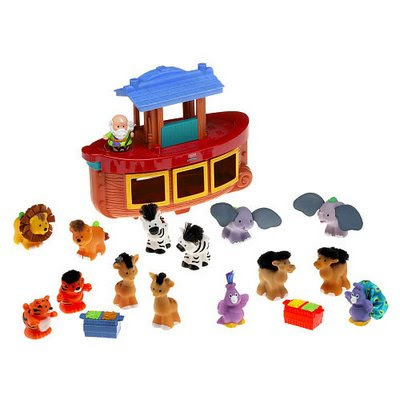 Today I bought my daughter a Fisher Price Little People: Noah's Ark with Ark Animals set. She has the farm and loves it so I thought she'd also really like this new one since it has so many cool animals. But when I got the thing home and started to try to get it out of the box (note that the photo above shows the item completely unboxed and there is no warning on the packaging of the arduous task you face to get it that way! ), it was like trying to break out of a maximum security prison. There were more twisty ties wrapped around plastic anchors bound to cardboard fortified with packing tape than you can imagine. The thing took me the better part of an hour just to get everything detached! I'm talking secure! Oracle could take a lesson from Fisher Price I think.... If Oracle had half the "unbreakable-ness" that Fisher Price employs in their packaging, Oracle would be unbreakable indeed!